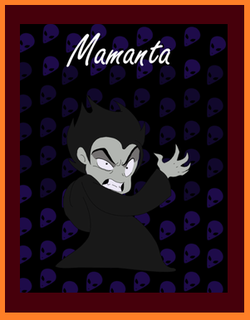 Mamanta is an entity whose entire life purpose is to cause others pain. He considers his ability to manipulate people into focusing on their weakest human qualities, to be his greatest skill. He feels no compassion for his victims, because he does not have any for himself. Although he is called up by the Ascended Masters to answer for his misdeeds, time and time again, he is absolutely defiant and determined to wield his tainted cleverness for his own ends. Janelle M. Wilson was raised in Kane, PA, surrounded by the Allegheny National Forest and spent many days of her early youth exploring nature and wildlife. Her obvious artistic skills are a combination of formal and informal art training. She graduated with a BA in Radiological Sciences in August 2013 and now works as a Radiographer. She spends her free time working on writing books and creating various art projects. The inspiration for Mamanta came from her friendship with a woman who channels "other world" entities.